Achieve a high-shine, long lasting finish in just 45 seconds with the Kensington Caviar from nails inc. Formulated without parabens, sulphates and phthalates, this unique formula adds chip resistance and elongates your colour wear, ensuring you've got a picture perfect manicure that lasts. Designed for women who demand results, this top coat is a staple addition to your nailcare regime. K.D. 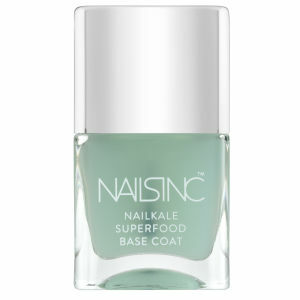 Apply one coat of of Kensington Caviar Base Coat followed by two coats of your favourite nails inc. polish. Finish with one coat of Kensington Caviar 45 Second Top Coat. When applying the polish, pull off the coloured cap and use the internal brush to paint with; this will give you better control and ease of application. Very shining and dry very quickly. What else do you need for a topcoat? Best one I've ever used, dries incredibly quickly, lasts a very long time as well. I will definitely be repurchasing this one, it's by far my favorite out of the countless ones I've tried in the past. This is the best I have tried. It dries so quickly. I didn't repurchase because i wanted to to some others, but I must admit none of the others are as good so I am back on this one. I do recommend t if like me you always make a mess of your nails because you cant wait for the to dry. This stops those problems.